To the Zacatecas GenWeb Project! The Zacatecas Gen Web Project is part of the MexicoGenWeb Project and it’s parent WorldGenWeb Project. This site is possible because of a network of volunteers working to provide you with genealogical and historical content for the State of Zacatecas and each of it’s municipalities for free. In December 1998, Mexico GenWeb was first seen on the internet as a project of WorldGenWeb Project. It was first sponsored by Mike Jarvis of Tucson, AZ, USA. Shortly thereafter the GenWeb pagtes for the states of Mexico appeared online. 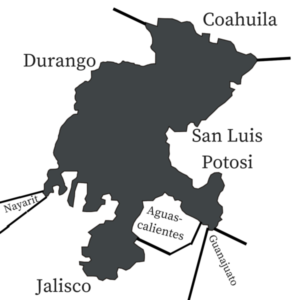 With it’s neighboring states of Aguascalientes – Coahuila – Durango – Guanajuato – Jalisco – Nayarit – San Luis Potosi, Zacatecas has 52 municipalities. Many of them are available for adoption. Would you be interested in becoming a Volunteer County Coordinator* (Padrinos/Sponsors)? Check out our Volunteer pages for more information. If you have any questions about the website, what we do or how to help out, you can email the State Coordinator, Patricia Stanard, or you can use our Contact Us page. Find out more about the World GenWeb Project here! Find out more about the Mexico GenWeb Project here!